This construction video tutorial provides detailed guidelines on the process to know if the beam section will crack or not? 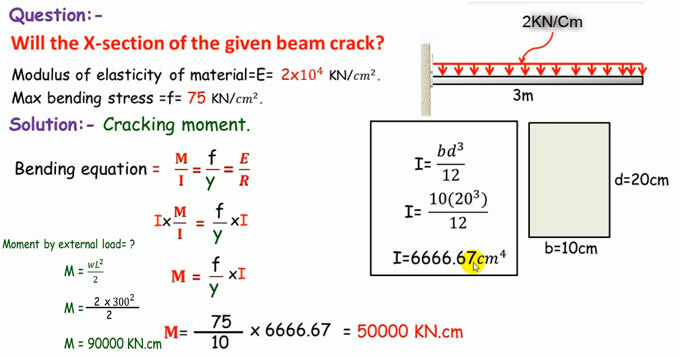 To figure out this, you have to measure the cracking moment and then compare the cracking moment with the internal moment resulting from external load. The length of the beam is 3 meter. The cross section of beam is given as the depth (d) = 20 cm and breath = 10 cm. Here, M denotes maximum bending moment that can be taken as cracking moment. Now, only select 2 pairs of equation out of 3 pairs, i.e. Now, multiply I with both sides, i.e. Here, I is an unknown factor. To get the complete process, watch the following video.